I love that this book exposes the horrors of animal agriculture in a kid-friendly way (though parts might be scary for some), but I’m not nuts about the illustrations. That said, I’ll be the first to admit that the aesthetics of this quirky book are definitely a matter of personal taste. 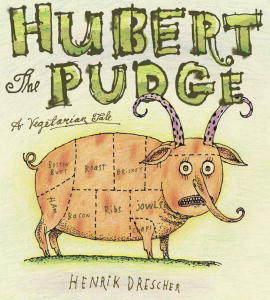 You and your kid might go wild for Hubert, the pudges, and the wacky coifs of Jake and his bride Heidi. Or you might be like me, studiously sticking to the text so I don’t need to look at the pictures. Ages 4 to 8. For more info, visit the North American Vegetarian Society or Library Thing.